The Dodge Challenger is as old as it is impractical. It’s based on an ancient platform, and its looks haven’t changed that dramatically since its 2008 revival. It has the turning radius of a bus and the traction of a cat on hard floors, it guzzles gasoline like its job is to make sure the world runs out of petroleum, and, on some trims, its splitter will scrape the ground more often than a kid’s knees. But if there’s one thing the 2019 Dodge Challenger SRT Hellcat Redeye, or any other car on the high end of the Challenger performance lineup, proves, it’s that age and impracticality mean nothing when you’re powerful as hell. If anything, they add to the charm. The Redeye, with its optional rear seat and widebody fenders, is a 4,492-pound land torpedo whose target can either be the road ahead or the nearest lamppost, depending on whether the driver gives the car the concentration and respect it requires. It’s also the most ridiculous Hellcat yet, sending 797 horsepower from its supercharged, 6.2-liter Hemi V8 to the rear wheels, compared to the regular Hellcat’s modest, anemic, how-do-you-even-merge-with-that 717 HP, and receiving trickle-down features from the limited-run, 840-HP, street-legal Demon dragster. Like the Demon, the Redeye also comes with only an eight-speed automatic transmission. Anyone who wants an option for a manual has to drop down to the regular Hellcat. Despite its dozens of performance upgrades, even an $88,900 Redeye like this one lacks a lot of modern supercar perks on the interior for its near-supercar price—from its squishy leather to its manually adjusted passenger seats. That makes it hard, on paper, to see why a car like the Hellcat Redeye is special. Yet it’s also hard not to feel a deep sense of respect when one blows by on the road, and impossible to fault a person who decides to buy the car. It makes sense, then, that the Redeye demands so much respect. Because when you think about it, even dinosaurs could rip modern creatures apart—whether the Earth’s climate is going up in flames around us or not. 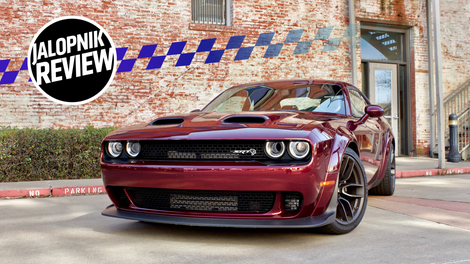 The Hellcat Redeye, in a way that can’t be natural, somehow feels larger than the last Hellcat Widebody did from the driver’s seat. It’s a huge car, like any Challenger, complete with a trunk large and accessible enough to haul a lifetime supply of cat food inside. It also sits wide and low to the ground, with its front splitter put in harm’s way at even the slightest change in road elevation. The “Octane Red” exterior paint on this particular Redeye, which is really a deep maroon, is stunning in an understated, classy way—it doesn’t scream “Hellcat” like a brighter or angrier color would, but it sparkles in the sunlight like the perfect shade of nail polish for autumn. Along with that red exterior paint comes a red key to match, since the Redeye, like Hellcats do, comes with a color choice between two fobs. The red fob ignites the engine at its full 797 HP, while a black one tones it down to 500 HP for rainy days or months when the gas budget has less wiggle room than usual. Starting up a Hellcat for the first time, or the first time in a long time, is like sitting at the wheel of a years-old racing game, where the car on the screen is a feral animal—completely disassociated from the person trying to connect with it, and so powerful that it’s impossible to reel in without doing the mental math necessary to connect with it in some way. The Redeye not only has its own agenda, but it fuels any egotistical needs its driver might have as well. Its supercharger whines with a mechanical growl, while its exhaust crackles upon deceleration at no credit to the driver—despite it making them feel superior to everyone around. Whether opening it up to get on the highway or just tapping the gas to make the overpowered car rear its front end in traffic, the fact that the Redeye’s 797 HP can barely be tapped into on the streets matters little. The fun of a Redeye, or any Hellcat, is simply existing in it. Black-key mode on the Redeye makes 500 HP feel calm, somehow. The car, while still incredibly fast, noticeably holds back, to the point that it’s almost impossible to spin the tires on a hard acceleration—a real feat, for a Hellcat. But the tires do spin hard on the Redeye at full power, even with a $6,000 wide-body package and 305 tires. Anything past a partial depression of the gas pedal on the street can break the car loose, and an intentional stomp of it—not all the way down, of course, since that would invariably cause an unscheduled meeting with the lamppost—results in an almost comical reaction: The car’s rear wheels becoming the equivalent of a frightened Scooby-Doo’s back legs, until they finally catch onto some patch of ground underneath them. The sheer inability to tame the Redeye makes it hard to let it loose within the confines of the speed limit, but the fact that there’s so much left in the car for when it hits the track is the entire thrill of it all. Inside, the Redeye has seat heaters, a wheel heater, a motorized telescoping wheel, and power seats for the driver only. A modest turn of the volume knob for the radio sends the car into earthquake mode, making the driver feel like the obnoxious person no one wants to be near at a stoplight. But in a Hellcat, you don’t care. You just embrace it. The 797 horses in a Redeye make for an almost cinematic burnout, too. From the inside of the car, the opaque white smoke is enough to light up a dark night sky, and the only things reminding the person in the car that this isn’t a dream or a set of special effects in a movie are the thrashing of the shackled monster at their feet and the hot, choking smell of tires that surrounds them. The central feature inside of any Hellcat, though, is the Performance Pages app in the infotainment screen. The app, which shows things like power, torque, boost pressure, G-forces, gauges, timers for different elements of a drag-strip run, and charts to track performance on the dyno, proves that even something that looks unchanged from the outside can give a plethora of modern, intuitive information about just how much of a performance car the Redeye is. FCA has its UConnect infotainment system in general figured out across most of its lineup, with a straightforward layout that’s easy to work even if you’ve never seen it before. There’s enough space on the screen itself and between apps to work the system well while driving, and it lets a driver customize their main app bar at the bottom of the screen for quick access to whatever they use most. FCA actually had to take this Redeye loaner back for a week because its screen—where most of the important settings in the car, like the power ones—began cutting out after a few days. With about 5,800 miles on the Redeye, the screen would crash and restart once every 45 seconds or so while running, making it impossible to access those settings or listen to the radio in peace. The company replaced the system, saying later that this was a preproduction Redeye and this wasn’t a known issue. FCA also said tests in the shop showed that it wasn’t a problem with the company’s UConnect infotainment system, and that it sent the radio off to its manufacturer. The problem never made the car unsafe to drive, though, even if slightly annoying. None of that matters much in the Redeye, though. Some materials unrelated to its straight-line performance feel inexpensive, sure, and there might be a few quality issues along the way. But anyone who buys a Hellcat, or understands it at all, expects that, and it makes the car no less incredible of a machine. It’s worth noting that $88,900, as tested here, is a lot to ask—a “normal,” 717-HP Hellcat starts at $60,695, and most of the ones we’ve tested have run between that and $70,000 or so. That’s not cheap for most people, but it is a hilariously cheap way to get 707 HP from the factory. So, why spring for the Redeye? There’s probably not much of a reason to, unless you want to track it. In that case, and with the Demon’s limited production and exclusivity, there are some benefits over the Hellcat that drag racers would find value in, but the additional tweaks here don’t seem to affect street performance in a significantly noticeable way. For most people, the Hellcat is enough—more than enough, really. In the end, the Hellcat and its new Redeye trim aren’t about modernizing, serving practical needs, or being convenient to the people in them. They’re a testament that the brutish soul of the American V8—a car rudimentary in most aspects unrelated to power or performance, and with an affinity for guzzling gas—will always be charming, even if it does eventually fade away in the move toward more environmentally friendly vehicles. While there’s certainly a need for that move, it’s hard not to feel a sentimental need for the old, impractical, yet ever-charming cars that never fail to leave us in awe—no matter how silly the idea of them may seem. The Hellcat Redeye might not be practical in most senses of the word, but its power and the general invigorating feel of driving it are enough to significantly outweigh any of its cons.